This recap is late, is as usually the case post-WSC weekend. It was so nice to see all of the cast members and fans hugging it out and processing what went down in last week’s season premiere. It made for an emotional weekend. But, more on that later. We have an episode to talk about! If you haven’t watched the second episode yet, or just need a refresher, Click Here for a detailed and spoiler-filled recap. Right out of the gate, I need to say that I felt this was a really good episode. It’s so hard to please fans. Many people complained that Seasons 1 and 2 moved “too slow” and they wanted more action. Last week, fans got all of the action they could handle and responded by crying that it was “too graphic” for viewers. And, naturally, their response to episode 2 “The Well” was also mixed. I thought it was smart storytelling. What happened in the woods with Negan is NOT the only story line happening at that moment. We’ve yet to check in with Heath and Tara, who still does not know Denise is dead (remember, it’s only been a week or two since our group attacked the Saviors in their sleep). Morgan and Carol have no idea what has happened or that Glenn and Abraham have lost their lives as well. The rest of the group back at Alexandria is completely in the dark. If this episode had started off with Maggie and Rick crying over Glenn, that would have been a terrible move. No, side stepping to Morgan and Carol was a great way to return to character development, the introduction to an important character and story arc, as well as allowing fans to catch their breath after such a sadistic game of Eeny Meeny Miny Mo. While some fans are complaining that “we’ve seen this before” with regards to yet another possible safe haven with a charismatic leader, yadda yadda yadda. The interesting thing is to examine the parallels. When we saw the Governor crying as he killed Martinez and shouting “I didn’t ask for this” it was a reflection of Rick, who himself was falling apart and no longer wanted to lead his group. These two men came from very different backgrounds and through extenuating circumstances each found themselves in a position of leadership. They each played their roles well, while hiding their pain and grief in those places of our minds that make us crazy. Deanna and Alexandria were a fluke. The fact that the horde or the Wolves or the Saviors hadn’t found them sooner is of itself a miracle. The people of Alexandria were sheltered, unexposed to life outside of the wall. That’s what makes the Kingdom different. The people of the Kingdom have experienced that world, but needed a guidance. 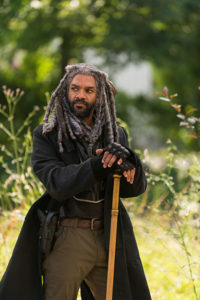 Enter, King Ezekiel. King Ezekiel and Negan are opposite ends of the same spectrum, especially if you know their backstories from the comics. Once again, men stumbling into leadership due to circumstances. [Spoilers ahead] Negan was a High School coach, and at one point a car salesman. For those who complained about his loquaciousness in the premiere episode, this is where it stems from. The man a) knows how to sell things and b) knows how to give the speeches that motivate the ranks. There is philosophical insight, psychological manipulation, and an honor code; all things your team would expect from their coach. Believe it or not, there is also a reason why Negan is as cold as he is and it involves the loss of his wife, Lucille. Draw your own conclusions, or buy the books; I’m leaving it at that. Ezekiel was a zoo-keeper who had an extensive background in community theater. This tells us two things, 1) he is a patient and caring soul, as most animal lovers are, and 2) he knows his audience at all times. Having a community theater, karaoke, and pub trivia host background myself, trust me when I say it is a handy skill to be able to turn it ‘off’ and ‘on’ based on who you are talking to. Each of these men is putting on an elaborate production for the sake of survival. When Ezekiel shows up out of nowhere, tiger in tow, I can only imagine it was a jarring site for the survivors he encountered. But, much as the successes of William Wallace were exaggerated to strike fear in their enemies and hope in the hearts of the Scots, this is how legends are made. Whatever stories or imagined adventures cropped up around their arrival, Ezekiel put on his actor-hat and rolled with it. Not only did it save his own life, but it enabled him to care for others. The Kingdom is like his zoo; the human residents are the animals trapped in captivity. They needed a keeper. Sadly, the residents don’t realize that the main reason they have skated by (unlike Alexandria’s dumb luck) is because, like the Hilltop Community, the Kingdom has an arrangement with Negan and his Saviors. Ever seen the movie A Bug’s Life? Can you guess which characters are the Saviors? They will protect communities from walkers, so long as said communities fork over half of what they grow or salvage, and a few women from time to time, as well. 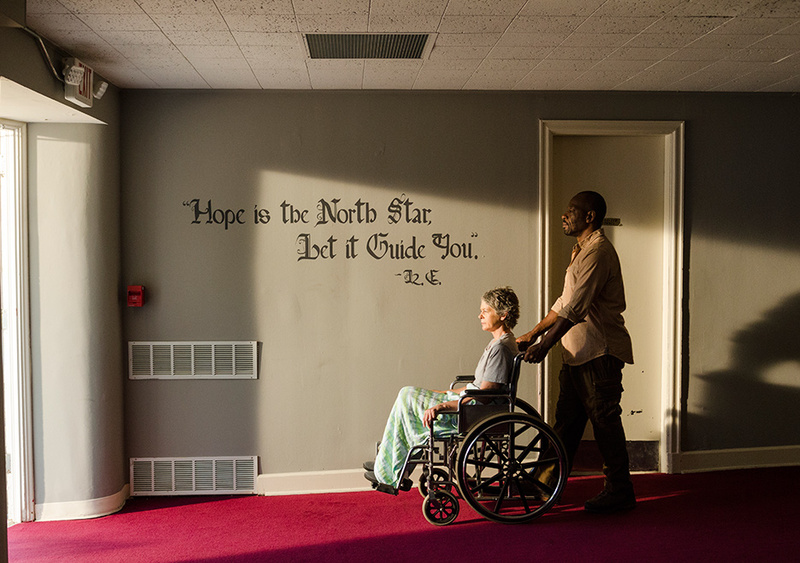 Morgan and Carol are aware of Rick and Maggie’s plan to dispatch the Saviors for the Hilltop, and in exchange become their new trade-partners. However, with the introduction of the Kingdom, Morgan and Carol are becoming aware of just how far Negan’s reach truly is. 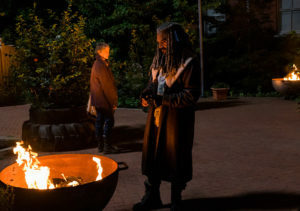 Ezekiel’s deception in order to protect his people is no different than Carol’s back at Alexandria. And they quickly see right through one another. Anyhow, I loved this episode. I love how the show-runners are using the source material, but giving it new life (no pun intended) with the changes in story line on the television series. I can’t wait to see how these two new environments of manipulation pan out. I’m also happy that Carol didn’t leave on her own, yet followed the advice of staying close by. When you constantly have concern for the needs of others and put them before your own, you will find that you have depleted your well. It’s okay to say no, to step back, and to breathe. Caregivers need time to heal, too. You take a break, Carol. Fill your well. Hope will float to the top.